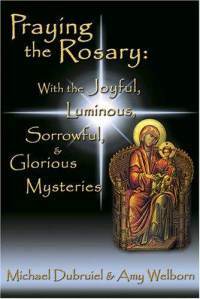 Michael Dubruiel conceived and put together the small hardbound book, Praying the Rosary. Click on the cover for more information. The Gospels show that the gaze of Mary varied depending upon the circumstances of life. So it will be with us. Each time we pick up the holy beads to recite the Rosary, our gaze at the mystery of Christ will differ depending on where we find ourselves at that moment. Thereafter Mary’s gaze, ever filled with adoration and wonder, would never leave him. At times it would be a questioning look, as in the episode of the finding in the Temple: “Son, why have you treated us so?” (Lk 2:48); it would always be a penetrating gaze, one capable of deeply understanding Jesus, even to the point of perceiving his hidden feelings and anticipating his decisions, as at Cana (cf. Jn 2:5). At other times it would be a look of sorrow, especially beneath the Cross, where her vision would still be that of mother giving birth, for Mary not only shared the passion and death of her Son, she also received the new son given to her in the beloved disciple (cf. Jn 19:26-27). On the morning of Easter hers would be a gaze radiant with the joy of the Resurrection, and finally, on the day of Pentecost, a gaze afire with the outpouring of the Spirit (cf. Acts 1:14) [Rosarium Virginis Mariae, no. 10]. As we pray the Rosary, then, we join with Mary in contemplating Christ. With her, we remember Christ, we proclaim Him, we learn from Him, and, most importantly, as we raise our voices in prayer and our hearts in contemplation of the holy mysteries, this “compendium of the Gospel” itself, we are conformed to Him.